(From left) K. Azril Ismail, Farzeera Emir and Chin Kong Yee. (From left) Ivan Lam, Kim Ng and Yohan Rajan. (From left) Izan Tahir, Kathy Lam and Florence Fang. 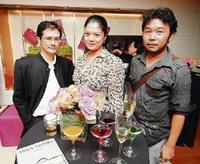 KUALA LUMPUR: An exclusive cocktail party was held at the Louis Vuitton Salon in Starhill Gallery. It was hosted by Lim Wei-Ling, the founder of Wei-Ling Gallery. 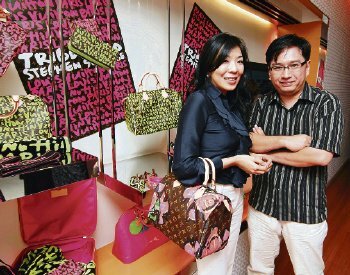 The party, attended by local artistes, saw the unveiling of Louis Vuitton’s latest products. The new range of designs is a tribute to the late Stephen Sprouse. He first collaborated with Louis Vuitton in 2001, and was the pioneer in introducing the famous monogram with graffiti. Louis Vuitton introduced two new collections called the Monogram Rose and Monogram Graffiti in memory of Sprouse, who died in 2004. Sprouse was a visionary artist and fashion designer, as well as a high-profile member of New York’s art fashion and music scene. He rose to prominence in the early ’80s with his fusion of uptown sophistication and downtown punk sensibility in his designs.